"Highly recommended--well-rounded, believable characters, a multi-layered plot solidly based on human nature, all authentically set in the England of 1917...an outstanding and riveting read." "Bess Crawford is a strong and likable character." Already deservedly lauded for the superb historical crime novels featuring shell-shocked Scotland Yard inspector Ian Rutledge (A Lonely Death, A Pale Horse et al), acclaimed author Charles Todd upped the ante by introducing readers to a wonderful new series protagonist, World War One battlefield nurse Bess Crawford. Featured for a third time in A Bitter Truth, Bess reaches out to help an abused and frightened young woman, only to discover that no good deed ever goes unpunished when the good Samaritan nurse finds herself falsely accused of murder. 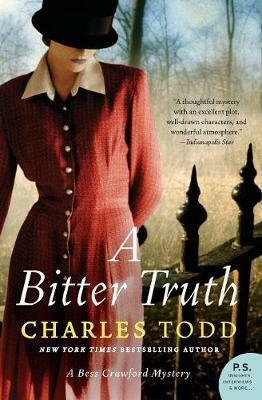 A terrific follow up to Todd's A Duty to the Dead and An Impartial Witness, A Bitter Truth is another thrilling and evocative mystery from "one of the most respected writers in the genre" (Denver Post) and a treat for fans of Elizabeth George, Anne Perry, Martha Grimes, and Jacqueline Winspear. While attempting to help a woman in distress, World War I battlefield nurse Bess Crawford learns a bitter truth, that no good deed goes unpunished. Returning to her London flat from the front lines in France for a well-earned Christmas leave, Bess Crawford comes upon a bruised and shivering woman huddled in the doorway. Propelled by pity, Bess takes her in. Yet despite the ill effects of a concussion suffered during a quarrel with her husband that erupted into violence, the woman decides to return home, and asks Bess to travel with her to Sussex. At Vixen Hill, Bess discovers a family in mourning for an elder son who has died of war wounds, and a husband tormented by jealousy and his own guilty conscience. But when a troubled houseguest meets an untimely death, Bess finds herself the prime suspect, and on the trail of a vicious killer that leads back to war-torn France toward a startling revelation that will place her life in dire jeopardy.